Strategy Map: This is one of the more complex tools I offer, but nonetheless effective. If well done, it can be a good means of communication with your colleagues inside the company, as well as your partners or suppliers outside. The ovals on the strategy map are generally used to represent strategic objectives. The arrows on the strategy map are used to represent cause and effect. The example below was produced by a team of my MBA students, working as consultants, calling themselves Mountain Valley Partners, in a strategy consulting assignment for Vermont Coffee Company, founded and run with his 30 or so employees, by Paul Ralston in Middlebury, Vermont—“good work”, he called it, four years later (notwithstanding a few layout issues). 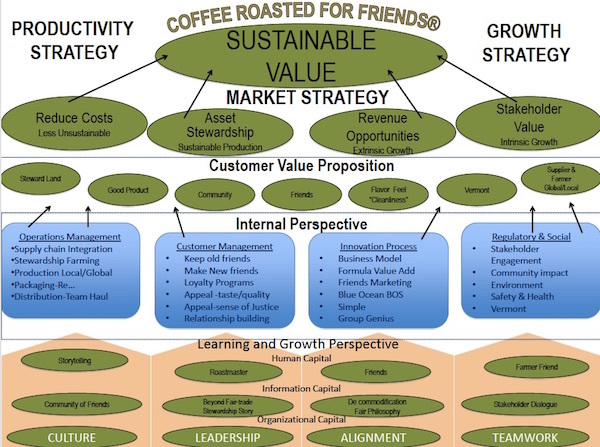 If you were to visit the Vermont Coffee Company’s website, you might find it interesting to compare what you derive from reading it, to what you see in the strategy map created a few years back. The top section of the strategy map is all about the business, the second section is about the customer. The third section is about the internal function. The point about having them all on one page is so that every part is coherent and the whole strategy hangs together. In the lower section of the students’ strategy map, the ‘learning and growth perspective’, indicates the areas of behavior that are likely to contribute to the desired results of the company’s strategy. In this case there are three strategic themes: productivity, market and growth. Of course, your strategy map will have your information, but the headings will remain broadly the same. Having such a strategy map will make understanding your role with both your colleagues and your stakeholders a whole lot easier. When using the strategy map, you may find it helpful to work on it in conjunction with the McKinsey 7-S Framework. The strategy map was developed over a period of years by Robert Kaplan and David Norton (The Strategy Focussed Organization, HBS Publishing, 2001). A lot more work has been added by others and you might find a web search would be interesting, as well as drawing you into the thinking about the Balanced Scorecard.